Those were the words that stirred my soul back in 1967. I was into UFOs before UFOs were cool. In fact, back in the 60s it was decidedly uncool to be into flying saucers and aliens and weird stuff in general. Now of course UFOs and UFO “hunters” are mainstream, to the point of being irritating at times. But since I was already uncool — I liked science fiction, and monster movies, and actually read books without being forced to — I figured I might as well pursue the things I liked and to Hell with what anyone else thought. I had UFO eyewitness report forms (printed up in graphic arts class) with me at all times, just in case; I had cards (also courtesy of a graphic arts class) that identified me as being a “Researcher of Oddities, Finder of Facts” with a focus on UFOs, Cryptozoology, and “Things”. (I am particularly proud of those quotation marks.) 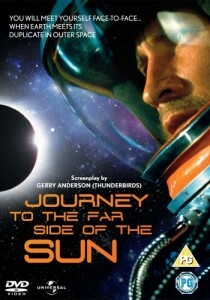 Ivan T. Sanderson and John Keel were my heroes. Anyway, you can see that I am no newcomer to these subjects. In a time of monster chic, I come by my monster geek honestly. In the 1960s UFO material was hard to come by, compared to the proliferation today. Oh, there were books by “contactees,” people who said that the space people were talking with them or even taking them for rides. There were a few books collecting the most famous sightings and photographs. And there was always science fiction, which had ever been willing to embrace the idea of Invaders from Space. But in 1967 there was precious little cultural support for someone with my tastes, particularly on television where, except for reruns of The Twilight Zone, such material was not likely to appear. (To put things in perspective, 1967 saw the premieres of The Flying Nun, The Carol Burnett Show, Mannix, and Ironside.) Star Trek was rolling, but those stories were firmly out there, not here on Earth. Architect David Vincent witnesses a landing of an alien spacecraft, but is unable to convince anyone as to what he has seen. What seems to be proof disappears, and Vincent seems to be just another member of the lunatic fringe of “contactees”. But he knows what he saw and, determined, chases about the country following the trail of the Invaders, trying to accumulate evidence and sometimes even foiling their plans. Unfortunately for Vincent (memorably played by Roy Thinnes), evidence is hard to come by. When the Invaders die they quickly volatilize away leaving only a greasy ash; their clothes and belongings burn away as well, and their final act is often to grasp a piece of alien technology so that it will be destroyed. Though Vincent occasionally gets support from those who believe him or have had similar experiences, he most often pursues his campaign alone. It will come as no surprise that some of his supporters meet unpleasant ends, sometimes bringing suspicion upon Vincent as being responsible for their deaths. There are only a few ways to detect Invaders inside their masquerade as humans: they are rather emotionless; physically, they have no heartbeats, their little fingers cannot bend, and if they have been too long without “regeneration” they start to show physical distress — sweating and breathing difficulties. Otherwise, their imposture is perfect. All of this means that Vincent does not know who to trust. He quickly learns that anyone might be an Invader. Or controlled by them. Or deceived by them. Or quislings, actively supporting them in the hope of a position in the new regime. He learns that while the aliens target positions of authority — police, military, doctors, politicians, clergy, organized crime — they may also be a gas station attendant, a waitress, a bus driver… Anyone might be an Invader, which steadily raises the paranoia and provides much of the drama in each episode. The Invaders is sometimes snap-categorized as “Cold War metaphor” or “60s Distrust of the Establishment.” But both of these, while appropriate up to a point, are overly-broad generalizations. Vincent is not a counterculture type but a clean-cut straight-up professional. He sometimes gets help from establishment figures, even inside the military, who turn to him for help in their frustration at not being believed by their superiors. The government seems to be not so much corrupt or controlled as primarily unwilling to conceive that there might be something outside of their ken. The overall message is not a distrust of The Establishment, but of all of consensus reality. Vincent faces not only a grand plan by the aliens to dominate or extirpate humanity, he faces the challenge of believing in himself, in What He Knows To Be True, despite overwhelming lack of support. The X-Files memorably featured a poster in Mulder’s office that read: “I Want To Believe”, this text in conjunction with a photo of a flying disc. A poster in Vincent’s life might read “Who Can I Believe?”, with a montage of faces hovering around our hero’s. Looked at critically from this remove of 40 years, I must admit that The Invaders has some problems that must be overlooked in order for the show to be appreciated. It is never really clear why the aliens do not just arrange an accident for Vincent (as they are very adept at doing for others — they have a device that mimics a natural death); the idea that Vincent’s death will “raise suspicion” becomes increasingly weak as the show goes on. While Vincent is famously an architect, he never seems to have to work — perhaps he has a trust fund that allows him to travel about on his quest. Nor does he seem to have family who worry about him, or any other associations. It is almost as if, were it not for his new career of alien-hunting, his life might be empty. But the problem is we didn’t see any of that happening. Vincent goes straight from his sighting to being a doubted man, on the road and sometimes on the run. Several times in the earliest episodes Vincent assures someone that “You have to believe me — I know what they’re like!”, only to have that person give him information that proves that other people know more about the Invaders than he does. Whether the show works for someone is largely a matter of taste. The slow building of tension and paranoia that involves some people, is “plodding” to others. Some find Thinnes’ acting “subtle”, others, “wooden.” Some people cannot get beyond a show about aliens with superior technology, that somehow so often devolves to fisticuffs. But the show does seek to grow over its run. Different “models” of aliens are introduced that can more closely approximate human emotions, or properly bend their fingers. (Though the stiff-finger peculiarity was often forgotten as hands were curled into fists for the above-mentioned brawling.) There are indications that not all of the Invaders are sympathetic to the invasion, and may actually be working to help humanity. Then they take Vincent for a flight in their saucer and show him a paradise of their creation. This flight, and the message of Space Brothers offering an Eden, is directly lifted from the reports of some of the contactees of the time. This episode makes clear that the overriding message of The Invaders is not simply a fear of invasion or replacement, or a mistrust of authority. The message of this series is that it is correct to fear the creeping seduction of Mass Conformity, to be true to oneself and one’s own beliefs even in the face of group resistance. The aliens directly employ mind control. But humans seem to indirectly utilize a mind control as well, a powerful group mindset that Vincent must resist as he keeps pushing the envelope and upsetting the status quo. Which raises the unsettling question: what if Vincent is wrong? What if he is just another of the contactees who got news coverage at the time as they spouted messages from Space Brothers about Universal Peace and A Golden Age — only Vincent’s message is the dark corollary. What if everything in the show is a creation of his mind, as he seeks to feel like an individual in a world that rewards conformism? In the 50s and 60s, several ufo researchers famously died mysteriously, or of suicide. Others would go on pursuing their pursuits and claiming their claims, to be mockingly mocked. What if Vincent is another of them, just more presentable, more seemingly mainstream? Can we believe him just because of the strength of his belief, and if we do believe him, why don’t we believe those others? All questions that add to the unease that The Invaders generates. 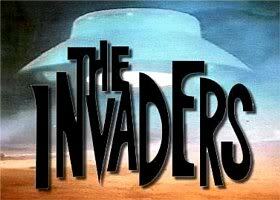 Is The Invaders great science fiction? No. It is not even necessarily great television. But it was an influential series with a wide range of guest stars that succeeded in developing a memorable tone, and presents a distinctive time capsule illuminating a time when our culture thought we knew what was correct but had developed reasons to doubt those assumptions. 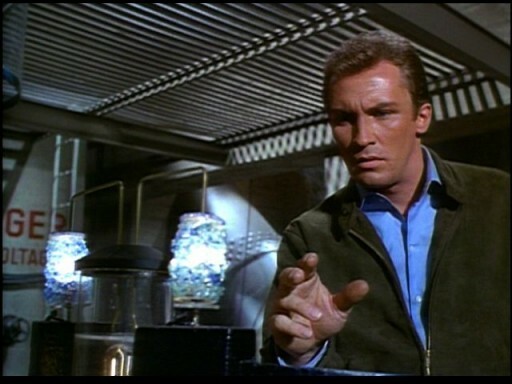 If you watch The Invaders on DVD, I would recommend that the first time you do so you omit the introductions featuring Roy Thinnes. It is nice to see Roy talking about the episodes, but some of the drama of each episode is provided by wondering who may or may not be an alien, and the intros unfortunately sometimes clue you in as to who the aliens are. Due to his association with The Invaders, Roy Thinnes was asked to be an honored guest at the 2003 Roswell UFO Festival. Thinnes has attended the Festival several times since, introducing showings of episodes and doing Q&A sessions. The actor said that, while he did not originally have a strong interest in UFOs, after attending the Festival he became interested in the subject. Thinnes also sells his paintings, some of which are of the David Vincent character. Learn more about these at roythinnes.com. Roy Thinnes also appeared in the 1990s version of Dark Shadows as Reverend Trask; the 1973 vampire movie The Norliss Tapes; the memorable made-for-TV Horror at 37,000 Feet (1973) with Buddy Ebsen, Chuck Connors, and William Shatner; and in 1969’s Journey to the Far Side of the Sun, as an astronaut who visits a mirror-image Earth in an orbit precisely opposite our Earth. 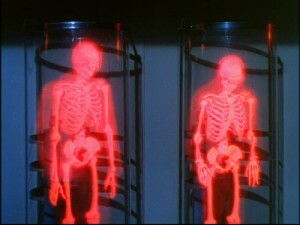 The “regeneration chambers”, tubes used to adapt the Invaders to our world, are strongly reminiscent of the pressure-adjustment tubes on the spaceship in the 1955 movie This Island Earth.